When I’m in Gyeongju, I always love driving by the Gyeongju Tower. It’s a 30-story tower with a giant pagoda cut right out of the middle. It’s really impressive, and it’s an observation tower so you can go up inside of it! A few weeks ago we finally made it a point to actually go inside of the Gyeongju World Culture Expo Park, where the tower is located. I expected it to just be the tower, but there was a beautiful pond with water lilies, children playing and even a few sculptures (but why are they so creepy?!). If you go in late may/early June, the gates in front of the park will be lined with roses of all colors. The great thing about Gyeongju is that it is gorgeous in all seasons, especially when the spring flowers are in bloom and in fall when the leaves turn gorgeous hues of red, orange and yellow. Gyeongju is a city you must visit at least once! Don’t live life with regret, add Gyeongju and its tower to your Korea Bucket List! By bus, take number 10, 18, 100 or 150 to Expo Park from the Gyeongju Intercity Bus Terminal or Gyeongju Station. This entry was posted in Gyeongju, Gyeongsangbuk-do, Summer and tagged ancient korea, gyeongju tower, Gyeongju World Culture Expo Park, korean pagoda, pagoda tower, south korea information, south korea tourist attractions, things to do in gyeongju, things to do in Korea, visiting south korea by Meagan & Dave | HappilyEverExpat.com. Bookmark the permalink. I’ve been just about everywhere in that area, but never to that park. The towers intrigue me, but I think the skeleton warrior even more so. It’s a nice little park, definitely more than I expected from just driving by. The sculptures were pretty odd. There were explanations next to them, apparently they are characters from a Korean folk tale. And what’s with those sculptures? Super creepy. NEVER?! You have to get him there ASAP! 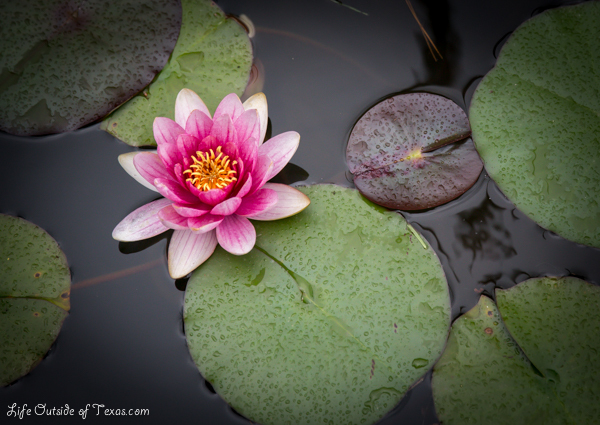 The lotuses will be in full bloom in a few weeks so it’s the perfect time to go. Those sculptures are so weird, right? I didn’t get it, but they cracked me up. 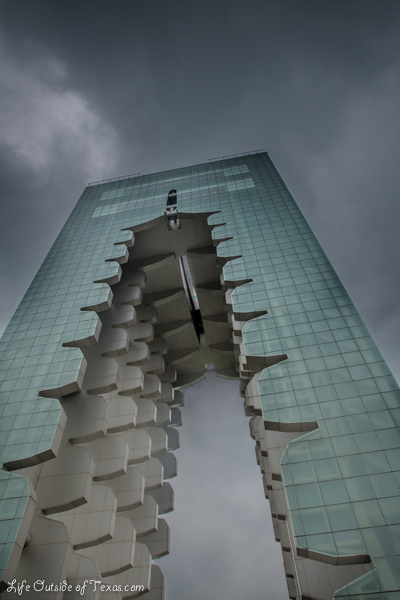 yeah … the sculptures look creepy, the tower is a marvel! Thanks for the comment. I love that tower! It definitely stands out. Meagan, I’ve been to Gyeongju a number of times, but never downtown, or wherever this tower is. It’s something new to me, and it’s a bummer. I would so love to have gone there. Beautiful! It’s really close to the Shilla Millennium Park, if you know where that is. Gyeongju is such an interesting city, I think it’s practically impossible to see everything. Sorry you missed it. How did I miss that tower when I was there? I agree: definitely a must-see place in Korea. I’ve found that it’s one of the few places that isn’t ruined by horrific, blocky, and flat-out ugly architecture. It’s managed to retain some culture and character. I agree. Korea just wanted to build fast and unless you’re in Seoul, there’s not much interesting architecture. I love how they try to keep it traditional in Gyeongju. It’s a very charming city. the garden is gorgeous and that architecture, wow. but the creatures are really scary to me. It’s a really pretty park. Thanks, Nan! I’ve really got to visit more places in Gyeongbuk. You really found a great part of the country to visit. Thanks again. That was such an amazing picture of the tower, btw. Thank you so much! I have to admit that I’m really proud of it. Gyeongju is awesome so you should definitely visit soon. And if you’re ever in the Ulsan/Gyeongbuk area, let me know. That tower is incredible! I had to go online to see more pictures. Fascinating! I’ve always been pretty amazed by it myself. I’ve never seen a tower with a giant shape cut out of it before so I really love it. Thanks for the comment! Awesome pictures! That tower is really unique, definitely haven’t seen anything like it in Korea. You have easily convinced me that I have to make to Gyeongju soon! You will not regret a trip to Gyeongju. There’s so much to do and it’s a ton of fun! Even if you’re not into history, there are tons of other activities to do. I´ll go this octuber but i have no idea how to get there if am in seul, is there a train or something? or it´d be easier go from busan.? Gyeongju isn’t far from Busan. I recommend taking the train (not KTX) from Busan to Gyeongju. The KTX will put you far out of the city, but the train stations in Gyeongju are located pretty centrally. You can catch the train to Gyeongju from the following train stations in Busan: Haeundae, Dongnae, Bujeon. None of these train stations are actually attached to the subway stations with the same names so just be aware. The Bujeon train station is within walking distance to the subway though. I hope you enjoy your trip! Please check out some of my other posts and let me know if you have any questions.